I think my puzzle friends will find this fairly easy and simple Murder Crime Detective Mystery Puzzle. Do comment if you have figured this out. I have separated answer from this page to avoid spoiler and link the answer page is given at the end of the puzzle. Do scroll at the end of the linked answer page to read the answer of this puzzle. Here is the Murder Mystery Puzzle from the famous Indian detective Byomkesh Bakshi. Mr. Byomkesh Bakshi was having an early walk. He had crossed a bridge when he saw a crowd of people talking loudly. Rushing towards them, he found that they were standing around a dead woman. Bakshi was a famous detective. He immediately started his investigation. This dead woman seemed to have come for an early walk, too. Seeing her handbag which was lying nearby, Bakshi ruffled through it and found what he was looking for - her identity card. Her name was Durga, and her house was about a ten minute drive away. Durga's number was also written on her card. Bakshi phoned the given number. About ten minutes later, a car came. Durga's husband got down, and on seeing the woman, rushed to her and started crying. Bakshi was about to console him when something came in his mind. He quickly had the husband arrested for murder of his wife. Can you tell WHY..????? You need to use your logical reasoning and analytical skills to solve these kind of mystery puzzles. Do checkout below mentioned similar Mystery Puzzles which will challenge your brain. 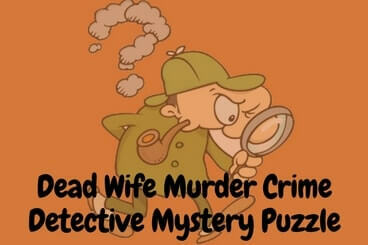 Crime Detective Mystery Puzzle : Play a detective and solve this Murder Mystery Crime Puzzle. Lateral Thinking Puzzles With Answers: Put on your out of box thinking cap and think laterally to solve these critical thinking puzzles. Escape Room Mystery Puzzles: You are stuck in a room and there are few doors in the room using which you can escape. However only one door will lead to your freedom and choosing other door is not an options. Can you choose the correct door to escape from the room? Detective Murder Mystery Puzzles with answers: There are many different Murder Mystery Puzzles which you require you to play detective and find the murderer. "come HERE quickly" lol...it took a while..
this is very obvious. they said come here quickly but they did not say where. so how did he know where the crime scene was? it means he killed her. they said: come here, but where is here? they did not say where the crime scene was. they just said "here". but how did he know where the crime scene was? he must have killed her.